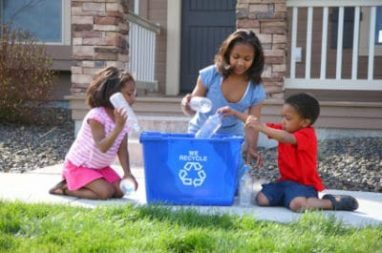 November 15 is America Recycles Day. It is a great day to start recycling if you haven’t yet, and it’s also the perfect day to recycle even more! Whether you are a longtime or first time recycler, recycling these five items is a great way to start saving the planet. Use as trash bags in car, bathroom, etc. The first step to recycling paper mail is to invest in a recycling bin to stand next to your trash can. It is simply too easy to throw spam mail and coupon books into the trash, and it can be inconvenient to leave your home to throw away individual pieces of recycling. When you buy that recycling bin, recycling will be easy! Recycling paper saves trees, and that junk mail and those envelopes add up fast! Plastic is one of the earth’s worst enemies—especially when it ends up in landfills. One thing many people throw away without even thinking is plastic shampoo, conditioner and body wash bottles. Instead of throwing them away, save the planet by quickly rinsing them out when empty, and putting them in your new recycling bin! Recycling cell phones, ink cartridges and other old electronic equipment is easy and crucial for the environment. Most major electronic stores have electronics recycling bins. When cell phones make it to landfills, their batteries are very harmful to the environment. When you no longer have use for a device, responsibly recycle it! If you have an unwanted vehicle baking in your driveway, consider recycling it! One way to benefit the environment and do even more good is to donate your unwanted vehicle to Wheels For Wishes. Wheels For Wishes uses your donation to benefit Make-A-Wish, helping to make dreams come true for local children with critical illnesses. Wheels For Wishes is a 501(c)(3) nonprofit car donation organization that provides you with free towing and a 100 percent tax-deductible receipt. Making the whole process easy and hassle-free is the Wheels For Wishes mission. To donate, save the environment, and to help make dreams come true, call 1-877-431-9474 or fill out an online donation form.